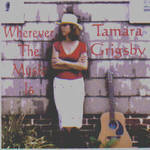 Sign up for Broadjam today to follow Tamara Grigsby, and be notified when they upload new stuff or update their news! A man finally gets out of prison to go back to his first love who has been waiting for him for many years. Jimmy messed up when he was a young man, shot some one, and ended up serving many years in prison. He was in love with his hometown girlfriend at the time. Years later, when he gets out and goes home, she is waiting for him. And it feels damn good. He says, "Sorry Mam. I gotta go. Gotta catch my ride." This song is about a woman who is disgusted, and isn't going to take it anymore.